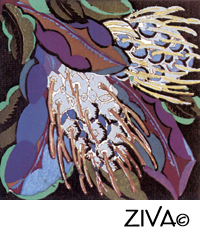 A sumptuous French Modernist Art Collection to create needlepoint art for your home! modernist painting styles such as Cubism, Art Nouveau, futurism, neoclassical and constructivism all played a part in the evolution of what we now identify as ART DECO designs. Many modernist painters and fabric designers, including Edouard Benedictus, flavoured their 1920’s designs with Art Nouveau touches and an adventurous abstractionism. Beneditus in particular created patterns with electric colours in an upbeat fantasy style, revealing a meticulous sense of design. Intended mostly for fashion and furnishing fabrics, wallpaper, rugs and decorative painting, his lively patterns with simple and vibrant colours are typical of the Art Deco style and place him among the very best designers of his generation. How stunning this modernist art design looks in this classic foyer! The delicate proportions of the deep mahogany front hall table complement the graceful cascade of colourful pine cones. By hanging gold damask swag drapes at the staircase, the overall effect ‘frames’ this elegant tapestry. 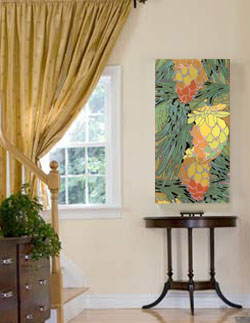 A vibrant palette of stylized pine cones and pine needles…. needlepoint art for you to create! The pine needles, created in a painterly style, are an ideal backdrop to the luminous colour blocks of golds, rusts, fresh greens and mustards of the cascading pine cones. PINE CONES REWORKED FOR A CUSTOM FOOTSTOOL COVER! I’ve redesigned the ‘Summer Pine Cones’ design into a square format to suit the dimensions of a client’s footstool cover. The Modernist use of colours and composition were respected to create a unique and bold design. I’m just putting the final touches on the painting of the canvas, and I thought you would like to see it to get an idea of its scale. It’s ready to ship out! In this semi-abstract design, you can feel the autumnal chill in the air, as the leaves are curling up and dying and the blue pods are ready to release their seeds. The old rules of colour have been thrown out and replaced with electric colours, depicting decaying autumn leaves and seed pods in vibrant blues, and purples. A dramatic accent for this contemporary bedroom! The range of colours in the tapestry, from warm taupe to cool blue, have been repeated in the rest of the décor…. with soft grey blue walls and a taupe carpet. I particularly like the contrast of the strong linear shapes of the today’s furnishings with the very loose semi-abstract shapes of the tapestry design. Note that this piece of needlepoint art has been framed with a wide wood frame in a taupe colour to complete the setting. 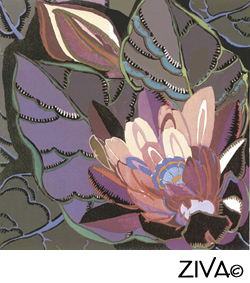 A graceful and painterly design with definite Art Nouveau influences! 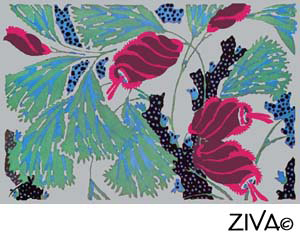 The stylized, furled spring buds in vivid fuchsia and greyed-red-purple are placed asymmetrically in the design, balanced by their delicate lacy leaves in spring green and blue. The soft grey background gives it a contemporary twist! Because of its asymmetrical characteristics, this organic modernist art design could work both horizontally and vertically on your wall… or also be stunning as an area rug! An ideal setting for this elegant piece of decorative art! Used horizontally, it creates an impressive focal point in this classic foyer. 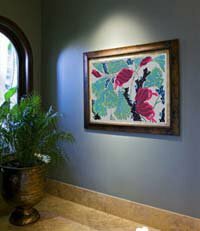 The dark blue-grey walls provide a dramatic backdrop to complement the vibrant fuchsia flower buds, and fresh green and blue leaves. The spotlight over the tapestry highlights all the vivid colours, PLUS accentuates the texture of the tapestry. The choice of a majestic wood frame sets a traditional tone to this modernist art design. Cascading semi-abstract seed pods in striking blue and blue- purple are interlaced with delicate flowing chains of ornamental flowers in white and copper colours. The electric blue background cohesively ‘ties’ all these elements together. Its long narrow shape is ideal for creating a stunning wall hanging for your home. Its evident Asian characteristics and details encourage the use of silk or silk and wool threads to enhance the vibrant colours. 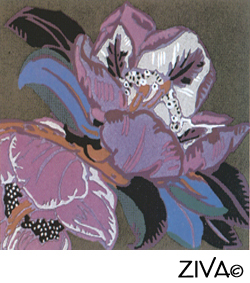 To give this design your own originality and creativity, your ZIVA Kit will include several suggestions of the types of stitches and threads you could use (with instructions) for the delicate background flowers. A chance to create a unique piece of needlepoint art! True examples of modernist art from the 1920’s! and the compositional freedom of placing the magnolias off-centre, with one even partially cut off! 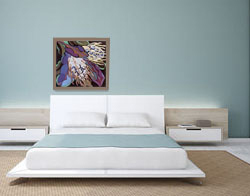 Needlepoint art adds the finishing touch to this minimalist bedroom! The sophisticated range of neutral colours from white and light grey to black, provide the subtle ambience for this bold modernist tapestry. Alone or as a pair, these Magnolia designs will create a stunning focal point in your home. What an amazing range of delicate, subtle leaf colours! 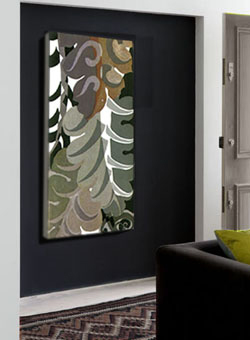 Cool grey-greens, gentle warm greens, soft mauves, coppers and taupes….. all designed into cascading organic shapes. ﻿Again, the flat use of colour, and the asymmetrical composition, boldly state ‘Modernist Art’. 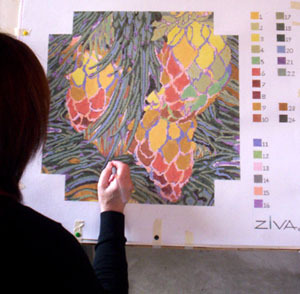 This approach to art and textile designs worked in the 1920’s and it still works today! If you are looking for a design to create a prime focus, this has to be it! Its scale, composition and sophisticated colours make an eye-catching statement as guests enter your home. The deep charcoal accent wall behind the tapestry completes the setting, with the green and grey tones from the tapestry being picked up on the sofa, cushion, and carpet colours. A truly cohesive mix of colours and styles! The Modernist Art Movements that were born in the early 20th century and came to full expression in the 1930s have gone on to influence artists and designers of all subsequent generations down to this day. From these dynamic modernist art designs, have a look at how Japanese designs from the 1920’s have inspired more needlepoint art. 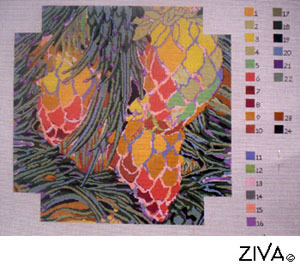 For ideas about making up your needlepoint art, go back to the Needlepoint Art page.